On 14th of September, an explosion of colors sounds and joyfulness took place near the skate park zone of Tineretului Park. 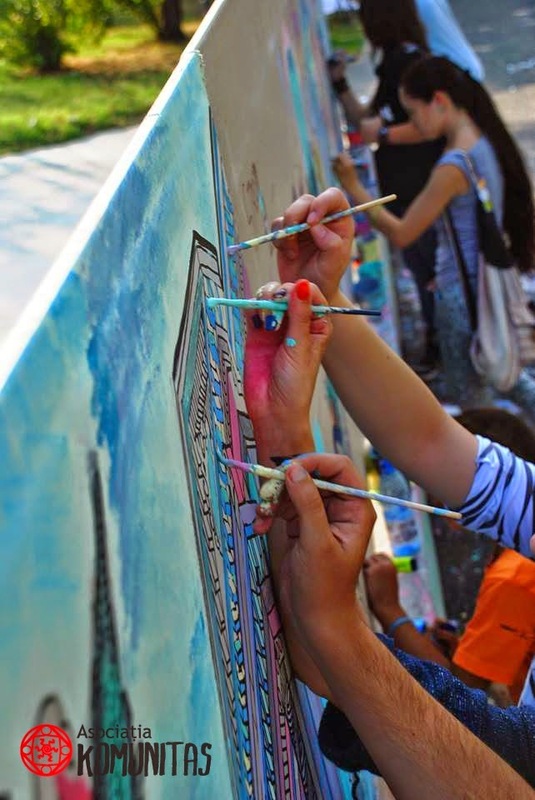 From noon until the evening, children, teen-agers, youth and grandparents enjoyed the moment together and explored the theme of the Ideal Neighborhood through the use of colors and forms, during a pilot-experiment called Paint Party, organized for the first time in Romania by the Komunitas Association. Started by Ortaku, Buzu Buzu, Oana Necșulescu, Ana Măriuca, the collective artwork managed to get everyone that was present involved and excited, even more so because the inspiration and the desire of painting were entertained and encouraged by the music of DJs Ufe and Alt Om, who mixed enthusiastically until the evening. So we painted, danced, mixed the colors and invented some new shades, we exchanged opinions and versions about the Ideal Neighborhood, told stories and met new people. We completely enjoyed this colorful event-experiment. Briefly, beyond the spectacular picture realized at the end, Paint Party brought people together, made them think in a very non-invasive way, and built a small island of joy and positive social interactions in a sunny Sunday afternoon. 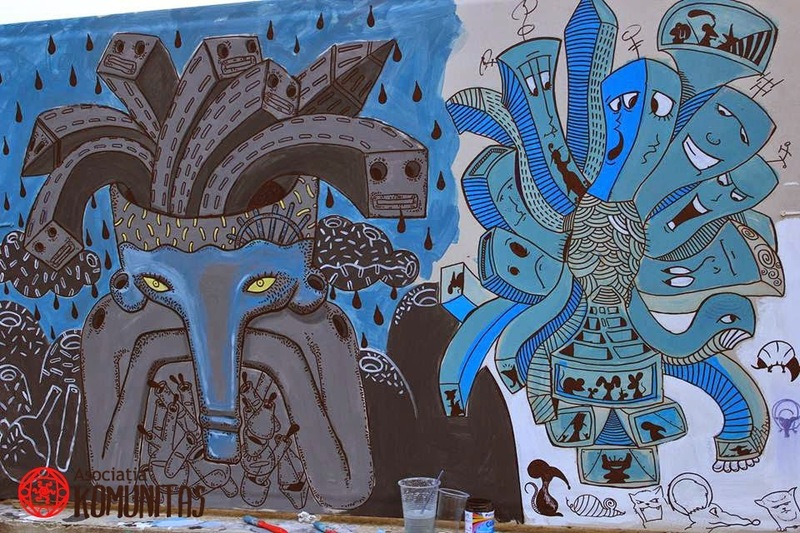 In numbers, the party meant 50 liters of paint, 100 paintbrushes, 15 meters of billboards, scores of tunes mixed, and scores of participants that immortalized in colors their version of the Dream Neighborhood. The experiment initiated by the Komunitas Association was more than successful, considering that the billboards were painted in a very short time, so that we had to use both sides of the billboards. Our expectations that 15 meters will be hard to be fully painted by a shy public and unaccustomed with these kinds of experiments were contradicted by the reality, so we plan to have a next Paint Party with 100 meters of billboards. The painted billboards will be donated to the schools involved in the project “Urban Spaces in Action”. 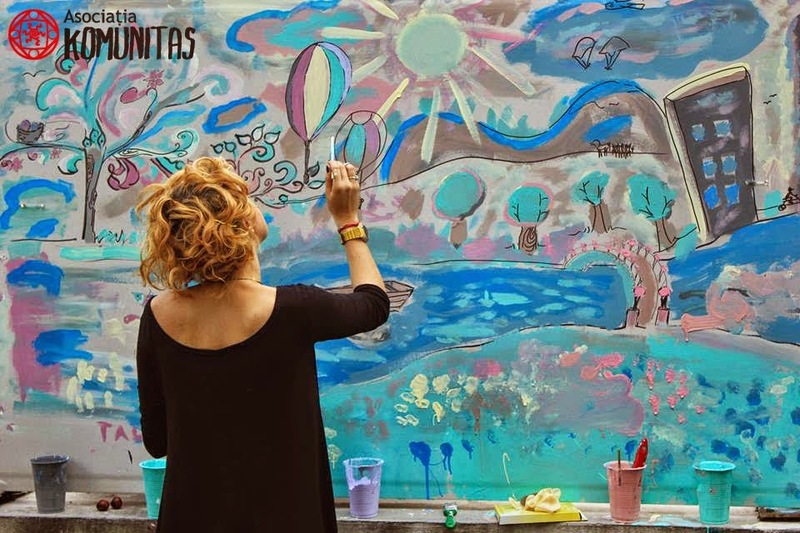 The event was part of “Urban Spaces in Action”, the newest initiative of the Komunitas Association. The project is developed between the 1st of May 2014 and 30th of October 2015, and the working areas of the project are 3 neighborhoods from Bucharest: Tei, Tineretului and Timpuri Noi. The project is financed through SEE grants 2009 – 2014, within NGO Fund in Romania.